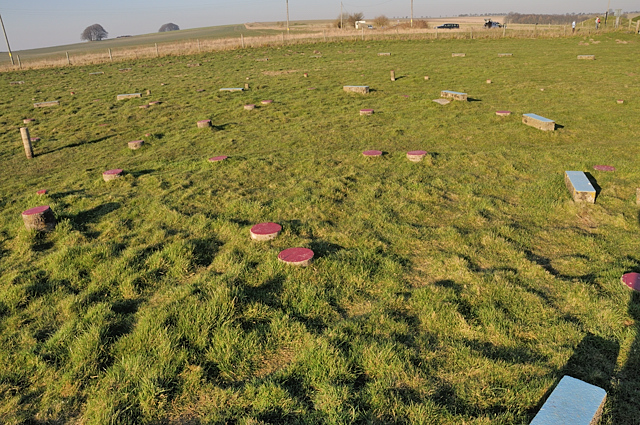 "A part of the World Heritage Site - Stonehenge, Avebury and Associated Sites"
The Sanctuary today is not the most exciting of monuments to visit, being a number of circles of markers showing where different post holes have been found. It is located at the point the A4 crosses The Ridgeway. This is the start of the Ridgeway Path. The markers are concrete blocks of different sizes, shapes and colours. No one knows what this was, we know that The Avenue, a line of large stones from Avebury leads to The Sanctuary, and from this some think it was a place of preparation for priests before setting out on a ceremonial journey to Avebury. Others have suggested that this was in effect the gatehouse and welcoming point for those arriving along the Ridgeway and going to Avebury. Some also suggest that there were two avenues, another running to the west and both are snake or serpent like, making perhaps The Sanctuary the head of the serpent. Others feel it was the residence of a revered person, as food remains and bones including human ones have been found here. Another theory is that this is the remains of a double stone circle that replaced an earlier wooden version made up of 6 rings. The bones may have been scattered by ploughing over several barrows also on the site. When Aubrey saw it he recorded it as a double ring of stones. Although Stukeley also recorded quite a number of stones on his drawing of it, he was to witness much of its destruction during the period of his visits. The Sanctuary remained intact until 1724 when it was completely destroyed to enable ploughing to take place. William Stukeley, who witnessed the destruction of the site, remarked that it was demolished, “For a dirty little profit”. The destruction was so complete that the site was to become lost and forgotten until Mrs. Maud Cunnington was able to locate it once more in 1930 prior to her excavation of it. She found 162 postholes and thought it was a timber version of Stonehenge, she had only shortly before excavated Woodhenge, near Stonehenge. Although there is no official archive of this excavation there is an unofficial one, in the form of diaries by the Foreman of the site Willy Young. These diaries exist in three forms, a longer and shorter version, both at Devizes Museum and original sketches and notes used to write them, that are in the Alexander Keiller Museum at Avebury. These give far more information than the published version and some of this material supports the idea that the site was made of posts rather than a roofed building and that the posts may have been adjusted, as there are several steps packed into the bottom of some holes as well as movement of holes. He was brought in when the remains of the stone holes were found so some earlier parts are not covered. You can read a little more about this by clicking here , and looking some way down the page that will open in a new window. There are three animated reconstruction videos of different phases on the digitaldigging website, showing one view of how the site may have looked. It is said to have been built around 3,000 BC, 5,000 years ago, and to have been a complex round structure, possibly a building or possibly a wooden henge structure. Originally timber posts, these were later replaced by stones, all the positions today marked by concrete slabs. Later than the original build, but after Avebury was constructed, The Avenue joined The Sanctuary or its location to Avebury. Not far from here, some years back I found the remains of another stone circle that appeared on older maps, but not on current maps, suggesting that there were more stone circles than we are aware of today. There is said to be a find of a similar series of markings/structure to this near the Stanton Drew Stone Circle in Somerset, but I haven't found out more on this. The site is managed by the National Trust, owned by a government department under protection of English Heritage, with the small amount of running costs for this site being shared between the NT and English Heritage. Entry is free. Getting there: 5 miles west of Marlborough on the left (south) side of the A4. Access: From main road, parking outside. Notes: This is part of the World Heritage site that links together many sites in the Avebury area.